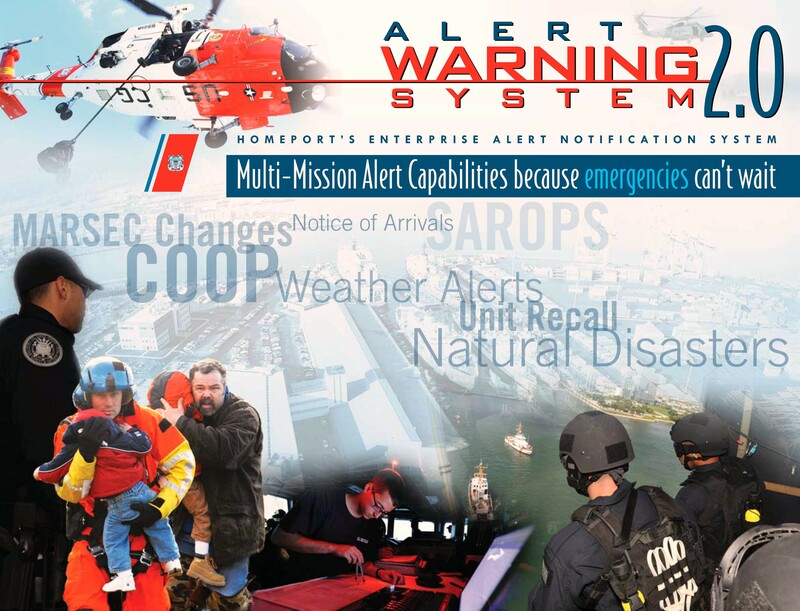 The U.S. Coast Guard has cut over a nationwide server-based mass notification system as part of a major upgrade of its Alert and Warning System (AWS) for maritime operations. The system, using an IWSAlerts platform from AtHoc Inc., encompasses more than 100 USCG facilities, from headquarters down to district, sector and local stations. The system has the capability to reach 50,000 USCG personnel and maritime industry members from Maine to Hawaii. The AWS system currently has about 26,000 registrants, said an officer with the U.S. Coast Guard Operation Systems Program Office, whose identity has been withheld on official request. The officer had direct experience with the procurement and deployment of the system. The U.S. armed services continues to be a strong market for AtHoc. The company has sold mass notification systems to the army, navy and air force. NASA's Johnson Space Center in Houston is also a customer. "This is our first and largest [sale] into the homeland security area, "said David Box, head of marketing for AtHoc. 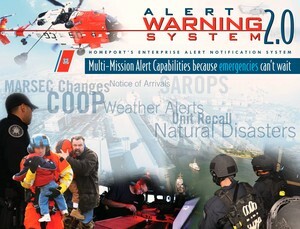 AWS 2.0 will use email, landline, wireless, satellite, fax and text messaging to transmit alerts and messages to Coast Guard personnel, port officials and thousands of civilian vessel operators on natural disasters, hurricane preparedness, search and rescue operations, and waterway closures, said the Coast Guard official. The AWS was set up under the Maritime Transportation Security Act of 2002 for the transmission of notifications and alerts to the maritime industry. For the Coast Guard, the AWS 2.0 upgrade represents an embrace of network-centric security and emergency communications systems. The centralized server-based system replaces and automates cumbersome emergency notification processes that depended on a string of actions local level, often without central coordination, the Coast Guard official said. It also will improve the Coast Guard's ability to account for the reception of messages and alerts--part of the mandate of the 2002 act--by taking advantage of the way IP-based services such as email and text messaging permit immediate reply. Until now, AWS notification often meant picking up the phone and calling each party individually, the Coast Guard representative said. "We are leveraging the technology to give the local Coast Guard captain a much more robust tool to effectively carry out their missions," he said. The AtHoc IWSAlerts system runs on servers based at the U.S. Coast Guard's Operations Systems Center in Martinsburg, W.Va., the officer said. Authorized users of the system, which include captains of ports and other Coast Guard personnel, can access the the system via an Internet connection through the Coast Guard's VPN and Homeport portal for information sharing. No extra local software is required. The AtHoc system's Web-based interface allows Coast Guard personnel to create and manage messages for distribution to selected lists of recipients. For example, if hurricane threatens the Texas Gulf Coast, notifications can be sent to specific vessels and ports from Port Arthur to Brownsville. "It gives ownership to the local level to target messages to the local level," the Coast Guard official said. In many ways, it was the growth of IP networking and portable wireless technology that led the Coast Guard to overhaul its AWS with a more automated, network-friendly system. The growth of wireless phones and PDAs was a significant driver, the official said, because that made wireless texting cheaper and more popular and made users more amenable to using text for emergency communications. Since the AtHoc system used open IT standards, such as the Local Directory Access Protocol (LDAP) and Active Directory, the system will integrate seamlessly with the Coast Guard's user directories. The Coast Guard also has left open the possibility for IWSAlerts integration into other IT systems.